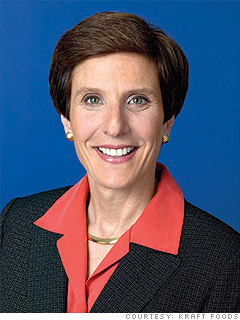 Kraft CEO Irene Rosenfeld said work-life balance is a “misnomer” in a recent interview in Forbes. You know, I think the notion of balance is a little bit of a misnomer. I think you have this sense that there is this scale and every day and everything is just perfect. The reality is that it kind of goes like this or like that. And so I think what my advice to young women and men–because I think, increasingly, we’re finding that the young men in the company are much more active fathers than, perhaps, the generation that preceded them–my advice to them is to figure out what’s important to you and make sure that you take advantage of that. So if there’s an important event in your child’s life or there is something that you need to do, do it. I think you can do it within the context of your business responsibilities. I think you can do it by working it out with your boss. But don’t come to regret having missed some of these hallmark events. But you can’t do all of them, and I think making some of those choices is important. I’m curious as to how she got the idea that work-life balance ever meant that “every day and everything is just perfect.” Are there people out there somewhere who are teaching that? Personally, I’ve never thought that work-life balance equals perfections, or that it should be measured on a daily basis – have you? To me, work-life balance should be measured on a weekly, monthly and seasonal basis. I agree with Ms. Rosenfeld that work-life balance is give and take. It’s short-term and long-term. There are definitely times when one area of life overshadows another, but the goal is to find ways to balance it out over time. I noticed that Kraft made the list of Working Mother’s 100 Best Companies to Work For, so it looks like Ms. Rosenfeld is doing some great things to help her employees balance work life and family life. I applaud her for that! What’s your take? Have you ever been hung up on the notion that work-life balance equals perfection? Please share your experience!